Taking beautiful photos for your salon - whether you’re a hairdresser, nail tech, esthetician, lash/brow artist, spray tanner, etc - has become absolutely essential for business. More than ever it’s important to take pretty pics and use them to boost your marketing on social media, your website, and everywhere else. As more beauty businesses and brands step up their game when it comes to photography, you will have to do the same for your business. It’s one of the best ways to appear professional and polished online. Not to mention that great photos do justice to the work you do, displaying it in the best light. Your clients are used to seeing row upon row of high quality pics on Instagram every single day, and if you want to capture their attention, you need to pay attention to the photos you take and share. The best part is, taking beautiful salon pics doesn’t require expensive professional equipment anymore! You don’t need to spend thousands or even hire a professional photographer to set up photoshoots and take stunning pics. This blog post will help you set up a process and give you tips and ideas for perfect salon photos. After reading it you’ll feel confident that you can make photography work for your salon, and you’ll be excited to get started taking stunning photos! 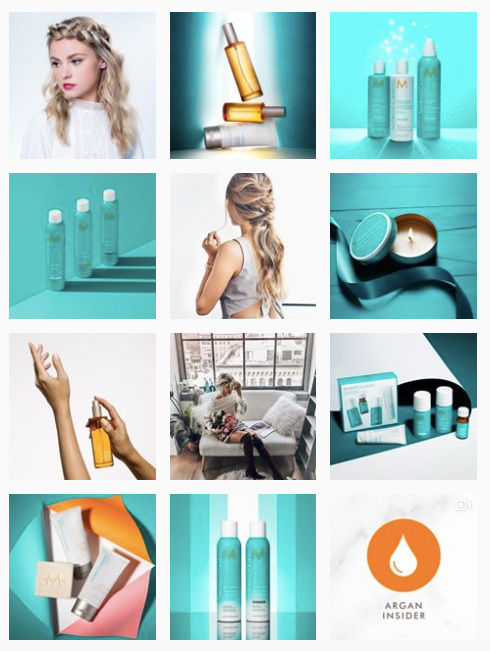 Although you know how important photography is, and you drool over all those perfect Instagram feeds, it’s so darn hard to do the same for your salon! You feel like you don’t have the right equipment and don’t have money to invest in a pro camera (don’t worry, you don’t need one! Feeling better now that you CAN and WILL have gorgeous salon photos to show off, that you took YOURSELF? Perfect, glad to hear it! :) Now let’s get started on the 6 steps of DIY photography for salons. 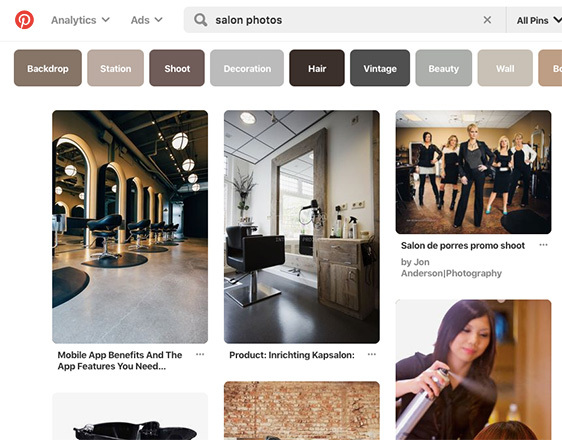 If you’ve read some of my blog posts about salon branding, you know that I adore using Pinterest for ideas and inspiration. Today we’re going to do the exact same thing for your photos. If you’ve never used Pinterest before, it’s really easy to create a free account here. Once you’ve done that, create a “private” board (only you can see it) called “Photography inspiration” or something similar. This is where you’re going to save all of your ideas for photos. It’s important to have an inspiration board because in the next step we’re going to make a “shot list” of photos you’ll take. But first you need ideas for salon photos that inspire you. Search “nail photos, brow photos, hair photos, pretty salons, portrait photography” etc on Pinterest and pin the photos you love. Don’t just pin photos where you love the eyebrows or hair etc. Pin photos that you actually love the photo itself. What do you love? The pose of the person? The filter? The background? The colors in the photo? As you’re pinning photos try to look for themes or commonalities in the photos you’re saving. I know that you probably have Instagram feeds you’ve been drooling and obsessing over. We all have at least one! 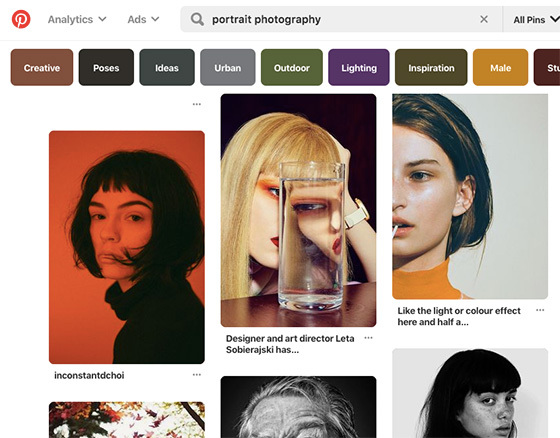 Take some time to visit these feeds on your computer and save your favorite photos to your Pinterest board (instructions for pinning Instagram posts here). These can be photos of hair/nails/faces etc. Or they can be photos from inside a business, photos of a team, or just regular photos. Again, once you’ve pinned some images take note of why you love them. Do they have certain colors? Certain filters or subject matter? Next step is to take a look at the photos you’ve taken and shared in the past on social media and other places online. Save the ones you love the best to your inspiration board. Why do you love them so much? Are they brighter than usual? Did you get an interesting angle for the shot? Is there a certain background in your salon that looks great? Make a mental note of these things for your whole Pinterest board to get an idea of what photos you will want to take. If you’re sharing photos on Instagram (which a large part of you are! ), you don’t just want to post photo after photo of your work (hair nails, skin, brows, etc)! Your Instagram should show all different aspects of your business, from yourself, to your personal style, your staff members, products, events, shot from your town, etc! Take a look at your favorite Instagrams, your Inspiration board, and your own past photos and write down what photos you want to take. You can be as broad or as specific as you want to be. What’s one thing you can do to all your photos that will raise their level to “pro”? Keep them consistent and branded! When your photos all have something in common, whether it’s a certain color, a filter, a subject matter, background, style, etc. Let me be clear on something - branded photos don’t mean that you should put your logo/watermark on them. In fact I don’t recommend this (if you really need to, put a small semi-transparent logo). Do I want certain colors or objects included? Do I have a brand color that I should include? What sort of photo colors do I love? Are the minimal or busy? Bright colors or neutral? Do I want to use a certain filter on my photos? Do my Inspiration Board photos use a common filter? What type of background do I want for my photos? What kind of vibe do I want my photos to give off? Stark/minimal, warm, vintage, fun, feminine? In your Salon Photography Planner or in a doc, write down how you want your photos to be branded, and what you’ll do to make them all consistent. As I mentioned at the beginning of this guide, you do not need professional photography equipment in order to take great pics. That said, there are some inexpensive things you can buy (even used!) in order to up the quality of your pics. Here are some ideas for you. My recommendation for a camera is either a newer iPhone or a newer, high-end Android phone. That’s because they’re super easy to use, you always have them on you, they have editing apps right on them (we’ll get to that later), and they actually take really good photos. If you don’t have a newer camera phone, I recommend you either invest in one for a few hundred dollars, or you purchase a used digital camera for a few hundred dollars. If you’re still taking photos with an older model smartphone, your photos will not turn out great. Camera phones have improved so much in the past few years! As for digital cameras, if you’re looking at investing in one, I recommend you look at buying a second hand camera for under $400 (you can check Facebook Marketplace, Craigslist, buy/sell sites). 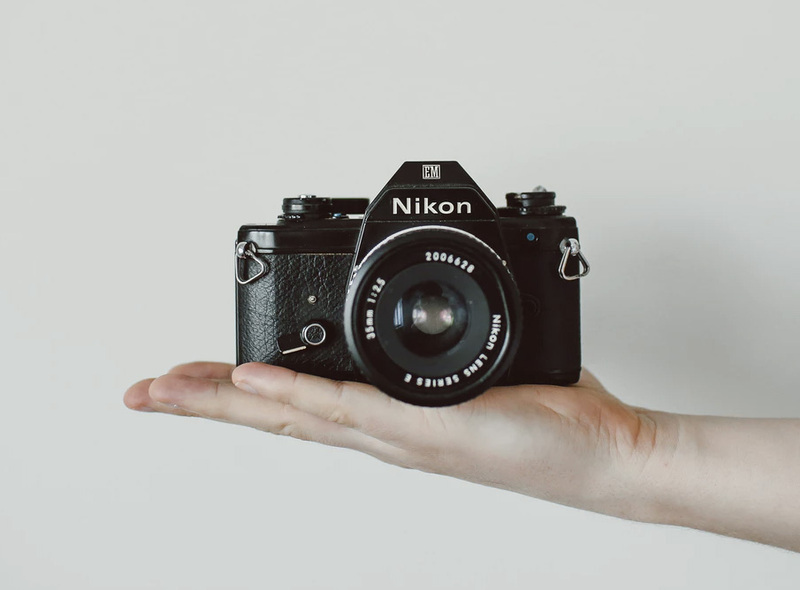 Search for a “Canon” or “Nikon” camera and make sure you have the lens included. DSLR cameras (as opposed to simple point and shoot cameras) might seem intimidating, but as long as you know the basics for taking closeup and faraway shots, and you know how to adjust the ISO (the brightness), you can take amazing photos with them. If you purchase a new or used camera, search Youtube tutorials for your model and you will learn a whole bunch in under 10 minutes! To be honest, having good lighting for your salon photos is actually more important than the camera itself. That’s because taking a photo with a bad camera in a bright setting will usually result in a better photo than a “good” camera but in low lighting. Whenever you take photos, you need lots and lots of light! More than you think you do. Our eyes adjust to low light way better than a camera does. So what are your options for lighting? First of all, if your salon has big windows or glass doors, try to take your photos nearby. Make sure the light is behind you (the photographer) instead of behind your subject. Second, if you have lamps and extra lights around, be sure to turn them on to add an extra layer of brightness. Often these still won’t be enough however, and it is usually worth it to invest in a mini or full ring light. You can grab a mini ring light that attaches to your phone for less than $30 on Amazon. I recommend this one if you’re just starting and and only for photos that are closeup like nails, brows, lashes, etc. 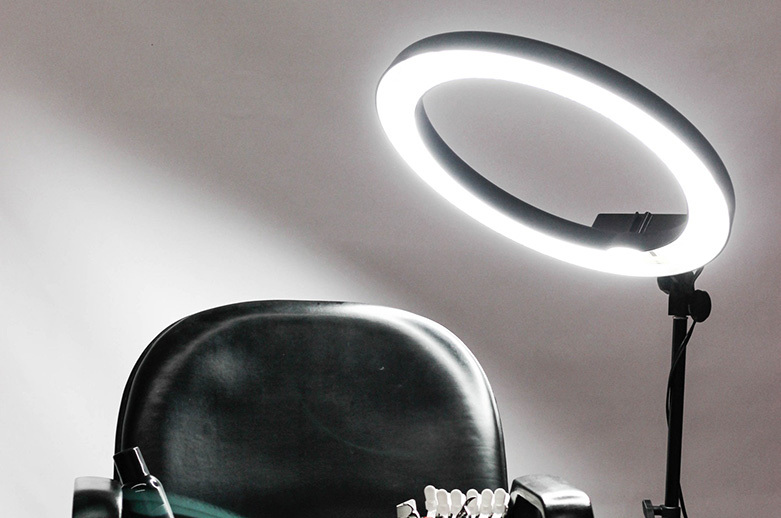 If you really want to taking beautiful shots, I recommend a larger full sized ring light. You can purchase one on Amazon or used on Facebook Marketplace for less than $150. The background of your photo is often overlooked but is actually so important! It’s an easy way to sneak in your brand colors, it adds to the mood of the photo, it keeps your photo minimal and focussed, and if it’s pretty enough your clients will LOVE taking selfies with it! Depending what kind of beauty business you have, it might be worth investing in a small background mat for closeup photos, and a wall background for selfies, team photos, client photos etc. You could look at going to a fabric store if you want a certain pattern, or search photo backdrop on Etsy or Pinterest for some inspiration! It’s worth brainstorming some ideas now for branded objects to put in your photos - don’t make it look awkward and forced, or put the same object in every SINGLE photo, but have a few objects on hand. Then take a stroll through a dollar store or mall and see what you can find! Do you want to do a big “photography day” to have a collection of photos to use later? How will you and your staff regularly create high-quality photo content? I think it’s a good idea to plan out a day or group of days where you’ll take a bunch of amazing photos all together. That way you can plan your makeup, clothes, invite in everyone you want for the photos, and check off your list “photo shots” that we wrote down before. One tip I have for you if you’re taking a bunch of photos in one day: switch up your outfits throughout the photos! That way, if you share these photos today and then once a week for the next 3 months, it’s not obvious they were all taken on the same day. It’s also important to create a process for taking consistent photos in your salon. If you download the Salon Photography Planner below, there’s space to write out a process and style guide for you and your staff to follow whenever you take photos. Plan out now what you’ll do regularly in your business to take beautiful photos consistently. You know they are important, so you just need a plan to get them done! In step 3 we decided how we want our photos to be “branded” and consistent. A big part of that is choosing the right filters and making slight edits to your photos. Adding a filter doesn’t mean a strong “Instagram-style” filter, and editing doesn’t mean adding in complicated special effects. In fact, I recommend that any photo filter you use is subtle, but that you always use it consistently, to add a similar tone to all your photos. So, how can you do the same thing for your photos? First of all, I recommend you download one or two mobile apps for editing your pics: Snapseed and Lightroom. Both of these are so useful for adding in filters. Above is an example of a nail photo that I edited with Snap Seed. You can see that I edited the white balance (made it less yellow), brightened it up, and cropped the photo to focus on the nails. If you’re not sure which filter to add to your photos or how to make them look “right”, look back at your Inspiration board. Play with your photos to make them look like your favorite inspiration images, and then save that as a preset filter that you can apply later to all your other photos. You’ve done it! You’ve just created an inspiration board, developed your own photo style, and set up a plan to take beautiful photos for your salon from now on! 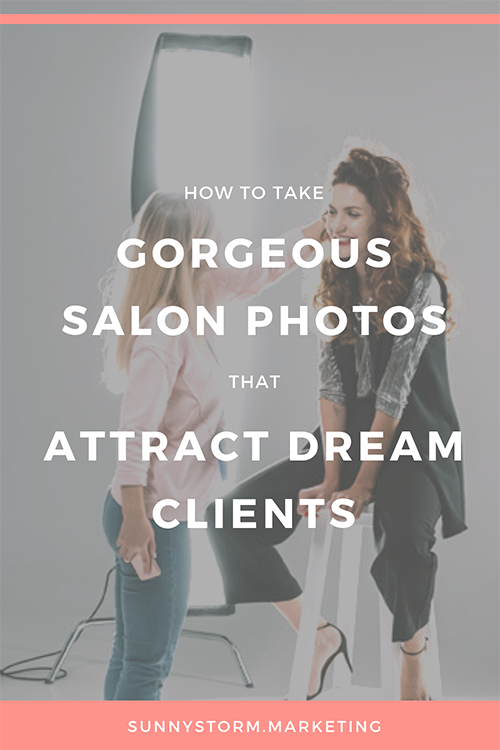 Photography is so important for salon marketing in 2019, and I promise that if you invest some time (and a bit of money) in your pics, it will pay off like crazy this year. Once you have your photos, be sure to share them on Instagram in the coming months, use them in your Facebook ads, your Instagram stories, your website, emails, and even print them off for your salon decor. Lastly, be sure to download my Salon Photography Planner below to set up your own plan of attack for taking amazing photos!